Russell Brown held a Michelin Star at the acclaimed Sienna Restaurant in Dorset for several years, but very recently decided to ‘quit while he was ahead’ and dedicate his time in full to food journalism and high-end food consulting. He is on the judging panel of the Great Taste Awards in the UK, appears on dedicated food radio shows and contributes regularly to Great British Chefs and Caterer Magazines. He is also a passionate and very talented photographer. Check out his profile here. Russell contacted Yummy Italy not only to fulfil his personal desire to experience something of the artisan food in Italy, having never visited Emilia Romagna before, but to also provide him with the experiences and knowledge to enable him to fulfil commissions for articles for Caterer and Great British Chefs magazine as well as written and photographic content for his own blog and website. We organised a visit to one of the finest (and smallest) Parmigiano Reggiano PDO producers, seeing the production process and carrying out tastings of various maturations from 18 – 60 months, as well as tasting freshly-made ricotta and some other soft cheeses. His experience was published in Great Italian Chefs magazine. We also organised a wine tasting with a small, local award-winning producer, where he spent time in the vineyard learning about the different soils and terroirs within a small wine-producing area, pruning and twining methods and finally the various production methods that this particular vineyard employs for its award-winning wines. Of course, he also carried out an in-depth tasting. Russell had already seen a ‘larger’ Balsamic Vinegar production, but we were keen for him to visit a ‘purist’ producer, where he could see and taste the differences of the few products offered, from the ‘base product’ a six-year matured ‘Condimento Balsamico’, to the definitive 25-year matured PDO Aceto Balsamico Tradizionale. We also explained the real methods for tasting the product, a specific technique that only professional tasters use. Truffles were also on the menu for Russell. He wrote about his experience for Great British Chefs Magazine. Seeing as no meal is complete without dessert, we also visited our local artisan gelateria for a tasting and to explain the basic differences between artisan gelato and ice-cream. 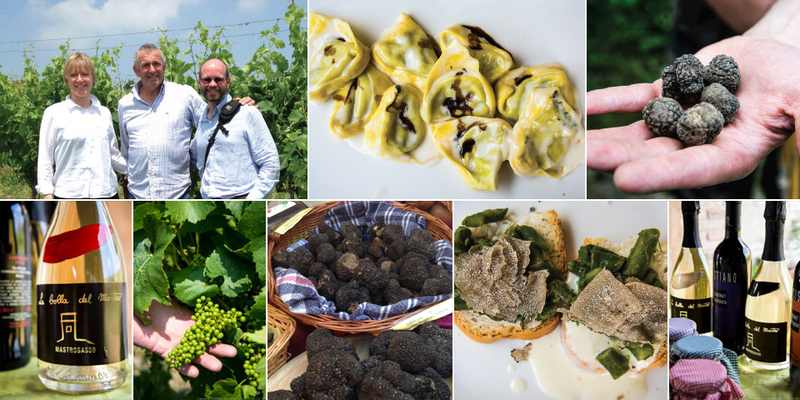 Russell says “Our time with Yummy Italy not only fulfilled our personal desire to experience something of the artisan food in Italy, but was also pitched at the right level to allow me to fulfil commissions for some articles for exclusive trade articles, as well as content for my own website”.